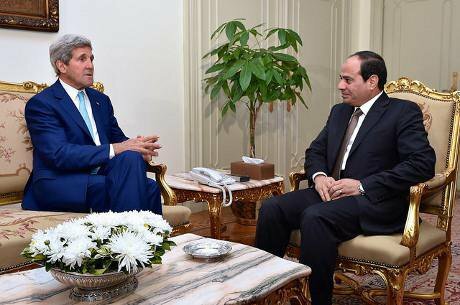 Spot the difference: the US secretary of state, John Kerry, meeting Abdel Fattah el-Sisi, last year as Egyptian defence minister, this year as president. US State Department / Flickr. Egypt’s regime is at it again. Having stuffed its notorious prisons with political dissenters and wantonly murdered hundreds of protesters, the military-backed government has issued an ultimatum to civil-society organisations. They must register under a regressive, Mubarak-era NGO law, which empowers officials to weed out CSOs deemed critical of state policy—or face dissolution. Although the deadline for registration has been extended by two months to November, human-rights advocacy groups are anxious about their very existence. Since the July 2013 coup which ousted the democratically elected, if flawed Morsi government, Egypt’s military rulers have turned the clock back on the popular revolution of 2011. They staged a farcical election in May this year, through which the military chief exchanged his uniform for a presidential business suit. Turnout was so sluggish that the voting period was extended for an unprecedented third day. The outcome, however—to confirm Abdel Fattah el-Sisi as president—was never in doubt. The entire rump of the political opposition is in prison, the press is gagged and public demonstrations are outlawed. Those independent civil-society voices which have not already been silenced speak out at their own risk. Yet many democratic governments have been coy about the goings-on in Cairo, revealing the ideological fault lines and inconsistent application of human-rights principles which stain international relations. The usual florid condemnation of tyrants manipulating electoral processes, from Azerbaijan to Zimbabwe, has been more or less absent—as are any substantive moves to put in place economic and military sanctions against the regime. Notwithstanding the challenges facing their government’s legitimacy, for Egyptian diplomats in international forums it is business as usual. Unsurprisingly, many of their positions are diluting the protection of human rights. In June, Egypt engineered a procedural resolution at the United Nations Human Rights Council on “protection of the family”, with the clear intent to deny members of sexual minorities their rights by excluding their relationships from the definition. In March, Egypt joined a group of “like-minded” countries in a statement urging the council to exercise caution in “advocacy of the causes of civil society”. At home, the list of transgressions by the military regime is indeed long. Principal among them was the massacre of more than 1,000 demonstrators opposed to the military takeover last year, as snipers, armoured vehicles and bulldozers were deployed to quell the protests during July and August. Human Rights Watch has uncovered evidence of a deadly conspiracy systematically to silence political opponents at the time, which may well amount to crimes against humanity. Shockingly, this year courts in Egypt have handed out death sentences through sham trials to more than 1,000 protesters, prompting outrage from UN experts who have deemed the actions of the judiciary “blatantly unfair”. In June, three Al Jazeera journalists were handed prison terms of 7-10 years on apparently trumped-up charges of supporting the outlawed Muslim Brotherhood. Earlier that month, the well-known civil-society activist Alaa Abdel Fattah and 24 others were convicted for mounting illegal demonstrations and sentenced to 15 years in prison for protesting against the routine practice of using military courts to try civilians for political offences. Scores of activists are languishing in Egypt’s prisons for protesting peacefully against the spate of restrictions on democratic freedoms. The entire rump of the political opposition is in prison, the press is gagged and public demonstrations are outlawed. In November last year, to reinforce the brutal behaviour of Egyptian security forces in dealing with protests, a repressive law restricting freedom of assembly was introduced. It places stringent conditions on public demonstrations and gives law-enforcement officials wide-ranging powers to disperse dissent on the streets. It is an affront to the values which underpinned the revolution that ended Hosni Mubarak’s near-three-decades grip on power. Earlier this year, CIVICUS spoke to some young Egyptians on the challenges facing their country. On the hijacking of the ideals of the revolution and suspension of the democratic process, one activist made these poignant comments: “I knew it came a little too easy. In only 18 days, we recreated the Egypt we've always dreamed of? My naïve self wanted to believe that but, when the cruel reality hit in 2013, we were stunned beyond words—even though we subconsciously knew anything could happen. The state under Sisi has gone far beyond crushing even the limited civic freedoms enjoyed during the Mubarak era. The international community and democratic states in particular cannot turn a blind eye to the overwhelming evidence of lack of political representation and gross human-rights violations. 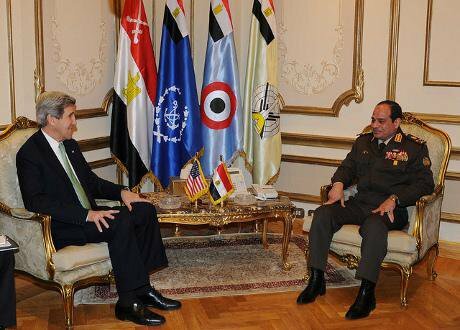 Every time they participate in the diplomatic farce of engaging with Egypt as if this were routine, they reinforce the legitimacy of the regime.